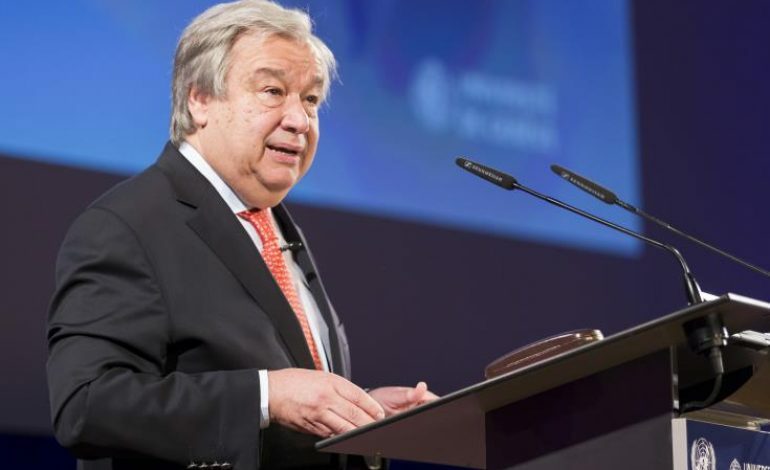 There are low expectations for real progress or agreement on the terms of reference, the UN Secretary General Antonio Guterres said in his report on his good offices mission an unofficial copy of which was handed over on Tuesday evening to the UN Security Council members. Guterres, whose special envoy Jane Holl Lute is currently engaged in an effort to formulate the terms of reference that will lead to the resumption of the negotiations on the Cyprus problem, noted in his report that he will request Lute to continue discussions on his behalf, adding that the way ahead must be well prepared, with a sense of urgency and focus. 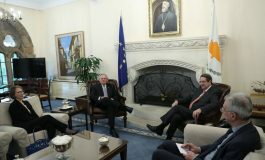 He expressed hope that the ongoing consultations will lead to a return to negotiations, “to which I could devote the full weight of my good offices, with the aim of reaching a lasting resolution of the Cyprus issue. In that respect, I call on the two leaders, their communities, the guarantor powers, and other interested parties to engage in these efforts constructively, creatively and with the necessary sense of urgency,” he stressed. The UNSG said that the skepticism on both sides regarding the prospects for a resumption of the talks continued to prevail in the aftermath of the leaders’ meetings of October 2018 and February 2019, which were conducted in private. “While some progress was registered on confidence-building measures, there are low expectations for real progress or agreement on the terms of reference,” he noted. “We have seen the bright glimmer of hope before, including in the Joint Declaration of February 11, 2014 and in the parties’ willingness to come to Crans Montana in 2017. Equally, however, we have seen our hopes dashed. All Cypriots deserve our commitment to make every effort to support the parties to deliver on the vision of an island united in peace and security,” he noted. Guterres also underscored that the means for a durable solution to the Cyprus problem remains, foremost, in the parties’ hands. As I have noted previously, a settlement will demand that each side accept less than the fullest measure of satisfaction on every issue. I also note that a comprehensive settlement will open up opportunities for growth, prosperity, and confidence otherwise forsaken, he added. Guterres said he was grateful for the receptivity and forthrightness with which all interlocutors have engaged Ms. Lute. “In all of these encounters, parties expressed their clear agreement that the time of endless negotiation is behind us and that the status quo is not sustainable. They also reiterated their commitment to finding a way forward toward a lasting solution under the auspices of the United Nations and expressed the view that I continue to engage, through Ms. Lute’s efforts, to find a way to permit the resumption of negotiations that would lead to an agreement within a foreseeable horizon,” he noted. The UNSG went on to say that the Council has been consistent over the decades in its support for a bi-zonal, bi-communal federation that reflects the political equality of the two communities on Cyprus. To aid the parties in advancing toward this vision, on 30 June 2017, I offered a framework of six points to help clarify the differences on key issues. I urge the parties to constructively consider these points, he pointed out. Guterres noted that he recognizes that widespread support for a horizon of endless process without result lies behind us, not before us. “There is consensus that an unchanging status quo — i.e., the lack of a resolution to the Cyprus issue — is not sustainable. Therefore, I will request Ms. Lute to continue discussions on my behalf. The way ahead must be well prepared, with a sense of urgency and focus. I urge the leaders and the Guarantor Powers to continue their constructive engagement with Ms. Lute and with each other, as necessary, to establish the basis for negotiations to be resumed. This engagement will need to be infused with a sense of purpose and determination to reach a successful end within a foreseeable horizon,” he stressed. “The almost four-year delay in the implementation of their earlier commitment to such measures had been a source of friction. These steps come at an important moment, as efforts are underway to agree on terms of reference, and represent some positive movement in the peace process since the closure of the Conference on Cyprus on 7 July 2017,” he noted. “I believe that the already implemented confidence-building measures such as the opening of the two new crossings in November 2018, as well as the interconnectivity of the electricity grids contribute to building some momentum towards peace and reconciliation on the island. However, only meaningful indications of a return to the negotiation table, including through an agreement on the terms of reference, will provide convincing reassurances about the real prospects of the peace process to the two communities, other interested parties and the international community at large,” he added. The UNSG said the he remains convinced that for a solution to be sustainable, the two communities will have to be well-informed about the contours of a settlement as well as the consequences of not achieving it. “This requires an open and constructive discourse that transcends polarizing rhetoric and that focuses on the benefits for all Cypriots. More efforts in this regard are essential and I encourage the sides, in particular the two leaders, to consider ways in which positive messaging and greater information about the process and the overall context can be further strengthened. This will also require greater involvement and engagement of civic actors, youth, and women to build confidence in the steps necessary to agree to and implement a settlement agreement,” he said. He also noted that more efforts should be directed at increasing opportunities for bi-communal cooperation which could contribute to trust-building between the two communities. The recent public perception surveys have demonstrated that there is interest for such cooperation in both communities.